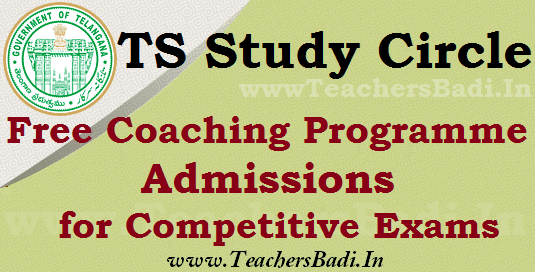 TS SC Study Circle Free Coaching Programme for competitive exams, #FreeCoaching Programme Admissions 2018 for Warangal, Karimanagar, Mahabubnagar, Nizamabad Study circles: Telangana State Study Circle is going to release the Free Coaching Programme Admissions 2018 Notification in this year and Warangal, Karimanagar, Mahabubnagar, Nizamabad Study Circles would invite the online application forms from eligible SC, ST, BC candidates belonging- to Warangal/ Karimanagar/ Mahabubnagar/ Nizamabad District for admission into coaching programme for competitive exams viz. Banking Services, RRB, SSC, State Group-l & II Services and other Central Services, at TS SC Study Circle, Warangal, Karimanagar, Mahabubnagar, Nizamabad for the year 2018-18. The coaching programme will be for five months and it is a full Residential programme / some of the seats may be allotted to other Telangana Districts. According to SC Study Circle , SC Welfare Director(Scheduled Castes Development Department), will train 100 SC candidates who will be selected for examination of group-2 posts across the state. There are 40 candidates who have been trained in SC Study Circles and 60 will be trained in various private institutions in Hyderabad . 15 mock teams have been set up with three members in 20 days course. Those trained in SC Study Circle will be provided with accommodation. SC SW Special Secretary Ajay Mishra has decided to train 100 students for each Study Center for Lecturers in Degree and Junior Gurukkal Colleges. Rs 75 lakhs will be spent for this purpose. Telangana State Study Circle,Warangal, Karimanagar, Mahabubnagar, Nizamabad Branches are going to release the Free Coaching Programme Admission 2018 Notification and Each Study Circle would invite applications from eligible SC, ST, OBC and Minority candidates for admission into coaching programme for competitive exams viz. Banking Services, RRB, SSC, State Group-l & II Services and other Central Services, at T.S. Study Circle for the year 2018-18. The coaching programme will be for five/Six months and it is a full Residential programme / some of the seats may be allotted to other Telangana Districts. SCs and STs and Rs.2.00 lakh for OBCs / Minorities. 2. Aspirants should not be employed or pursuing any other courses in any educational institutions during 2017-2018, since this is a full time residential course. 3. Aspirants should not have availed any similar coaching sponsored by the Government . elsewhere. 1. Admission is through entrance examination which is in objective question paper, as per the General Studies syllabus of the Banking Services. 4. Copy of SSC, Inter, Degree/ Professional Degree/ PG Certificates. 6. Bonafied Certificates from Class IVth to Class X. The date and venue of the entrance test will be communicated to the candidates by post / mail/ SMS. Warangal: For any further details, they can obtain information from Deputy Director, SCD Dept., Warangal. (Format of application and guidelines can also be downloaded from the Website : tsstudycircle.in. Mahabubnagar: For any further details, they can obtain information from Deputy Director, SCD Dept., Mahabunagar. (Format of application and guidelines can also be downloaded from the Website : tsstudycircle.in. Karimnagar: For any further details, they can obtain information from Deputy Director, SCD Dept.,Karimnagar. Nizamabad: For any further details, they can obtain information from Deputy Director, SCD Dept., 2nd Floor,Pragathi Bhavan, Collectorate Complex, Nizamabad.